HPopular writer and Outside columnist Sides (Stomping Grounds) interviewed participants in one of WWII's little-known exploits—the rescue of 500 American and Allied POWs from Cabanatuan prison camp on the Philippine island of Luzon. 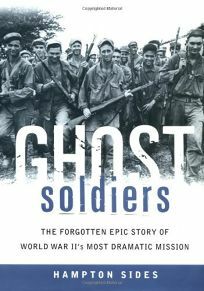 This gripping account intertwines the tale of these prisoners, who were survivors of the horrible Bataan Death March in 1942, and 121 officers and men of the army's Sixth Ranger Battalion. Led by Colonel Henry Mucci and Captain Robert Prince, these Rangers, who had yet to taste active combat, trekked 30 miles behind Japanese lines to effect the rescue, haunted all the while by the knowledge that if their secret mission was leaked, the POWs would probably be massacred by their captors. Sides includes the heroic efforts of Claire Phillips and other resistance fighters to keep the Americans supplied with accurate intelligence, and the scores of villagers who helped the POWs to safety. Some Alamo Scouts and two Filipino guerrilla groups provided no small assistance to Mucci and his men. The raid itself was almost anticlimactic as the Rangers burst into the POW compound, eliminating the garrison and bringing out the inmates in less than half an hour. It's a tale worthy of a Hollywood movie (and film rights have been optioned by Universal). The author's excellent grasp of human emotions and bravery makes this a compelling book hard to put down. (May 15)Forecast: This is for fans of Flags of Our Fathers who have been waiting for another installment. First serial rights have been sold to Esquire, and the author is booked on the Today Show. With more exposure like that, and with blurbs coming from the likes of David Halberstam and Jon Krakauer, this should sell hugely.